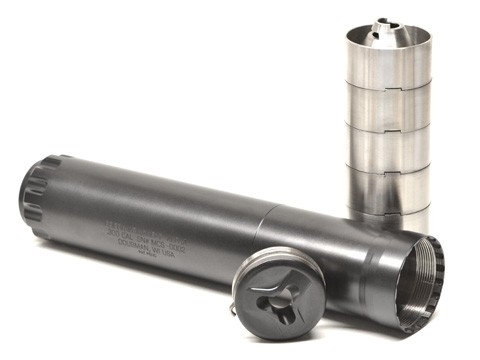 The Alpha Silencer is the first of it's a type, a hybrid, lightweight, centerfire suppressor with a Patent Pending Rachet lock baffle system. The Baffles are fully shielded and can be removed for cleaning and maintenence. Meaning you can shoot rimfire through 300 win mag with this suppressor. End caps can be switched from 30 cal to 22 cal. Included is a 1/2x 28 taper mount direct thread adapter, 30 cal minimalist brake mount, and 30 caliber end cap. Constructed from Grade 5 titanium and 17-4, the Alpha weighs in at a scant 14.5 ounces. Coupled with the Minimalist Taper Mount Brake, the Alpha has the lightest system weight in class at only 16.3 ounces. Using our Patent Pending HEDP baffle technology the Alpha achieves flagship performance common to longer or fatter silencers in a more compact slender package.